One of the more challenging achievements for this raid. Plan to bring 3 tanks. 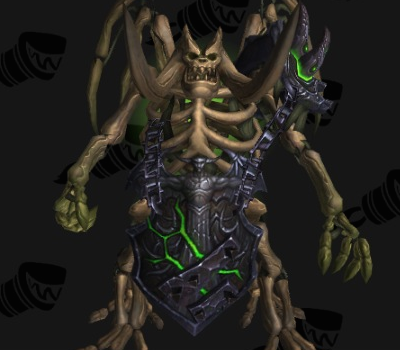 You want the doomlord away from the raid to avoid cleave and he will generally deal more dmg than mannoroth to the tank so you'll need a dedicated healer. Doom Spike will fall off several times during the fight for substantial dmg so a monk tank is recommended. Raid needs to be careful about stacking and there will be a bit more dmg overall since you're unlikely to interrupt all the shadowbolt volleys. You can tank swap on the Doom Lord as well.. Just run over and taunt the doomlord after the massive blast combo. You will probably need to be a little more careful about dmg on the add if you do so. The Empowered Fel Seeker occurs after the first fear in the final phase. It does 230-250k dmg to the Doom Lord per hit. So the add needs to be quite low. Other than controlling your cleave (spreading dots when you move him in for the fel seeker is a very real concern) and making sure you actually kill the boss (i.e. still burn hard entering the final phase)that covers the major hurdles for this achievement. Though not a dk, I believe that a blood dk should be able to use their ams to completely negate damage from the doom spike, which would make this achievement much easier. They would just need to ensure that the spike falls off during the ams. 1. Leave the summoner at the red crystal alone until one person gets the debuff from curse of legion. When curse of Legion is dispelled or goes away, a Doom Guard spawns. Then kill the summoner. 2. Have one tank take the doom guard away from everything else and take it down to about 5% hp. 3. Have another tank on Mannoroc and burn him down to 35%. 4. During P3 Mannoroc uses Empowered Fel Seeker (green waves). Have tank with doom guard chill by Mannoroc until its killed from this ability. Easy peasy in Legion. You don't really need two tanks for this, but it simplifies it further. i am trying to solo this, but when in phase 2 he destroys the column, i dont know how to avoid getting jumped off the platform. any help? To anyone having issues attempting to solo this achievement. A doing this in Normal difficulty with a tank makes it considerably easier. Ignore the red spire add in the first phase. Kill the other 2 until you have the doomlord popped. After that ignore the doomlord completely and single target Mannoroth down until he reaches his third phase. Standing with your back against the spires negates the knockback.. Upon reaching the third phase, just wait out the felseeker. Stand with the Doomlord in the felseeker and watch him perish. Note: The felseeker does about 150k dmg/landing. So dps the Doomlord down to ~400k to save you the trouble of waiting out 2 felseekers. Currently bugged. Mannoroth does not damage the doomlord. This achi seems bugged in the bfa pre-patch, he takes no damage from felseeker. Doom Guards are not taking damage for me tonight. Spawned two for no reason, got Mannoroth down to 27% and waited....after 5 Felseekers the Doom Guards had taken zero damage. So I hit em with drain life down to 25% and still they are taking zero damage. Finally jumped off the side to reset. 2. Before fight, once you get up to the upper portion, kill the two adds EXCEPT for the one standing by the RED spire. 3. You'll notice this add puts a debuff on you that spawns a Doom Lord. Let the Doom Lord spawn and then kill the red spire add. 4. Aggro Doom Lord with your pet, do not kill the Doom Lord. 5. Attack Mannoroth. Bring him down to 30% or so. Make sure your pet has aggro. 6. Keep Doom Lord and Mannoroth on the pet and let them duke it out in the corner somewhere. Do not attack Mannoroth. 7. Stay near the middle and keep your target on the Doom Lord. As the battle continues, the Doom Lord will slowly lose health to Empowered Felseeker which comes from Mannoroth. 8. Once the Doom Lord has died to Empowered Felseeker, nuke Mannoroth. Tuer un seigneur funeste en utilisant Visée gangrenée surpuissante, puis vaincre Mannoroth à la citadelle des Flammes infernales en mode normal ou supérieur.